Last week we launched our Christmas Hamper Appeal 2016 by asking you to help others over the festive season. The Express, together with the Community Awareness Programme (CAP) and the Rotary Club of Wakefield Chantry, will once again provide some much needed Christmas cheer to families with young children in the greater Wakefield area. Last year, with your help, we were able to provide more than 800 families with a much-needed food hamper to help them at the time when money is most scarce. This year we are looking to help more than 1,000 families - but we need the help of our generous readers. We need you to donate food, money or complete hampers so that we can pack and deliver them in time for the festive season. The donations can be dropped off at CAP’s offices and warehouse on Market Street in the middle of Wakefield. 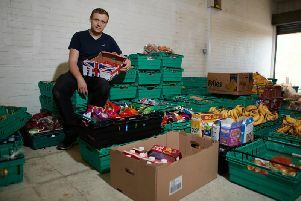 The food can include all dry groceries - such as tins, pasta or rice, tea, coffee and sugar, biscuits, jams, cereal, stuffing and gravy mix - and long life items like UHT milk and fruit juice as well as Christmas-themed food items. Please do not include alcohol or fresh food. Because of our ambitious target of making 1,000 hampers, we have already started collecting. The deadline is November 25, when the food will then be packed by rotarians and volunteers and distributed to the Early Help Hub network, which has seven hubs and 21 sites across the district. The hubs will then deliver the hampers to the families most in need in time for Christmas. For more information, call CAP centre manager Kevin Dobson on 01924 381119.